Building Furniture with Maple, Oak, or ... Fungus? When it comes to the material used to make office furniture, there are a few staples: Wood, metal, glass, laminate or some combination of these are the most common. In recent years, the move toward more sustainably produced furniture has made bamboo and recycled items popular go-to materials. But these environmentally friendly materials are just the tip of a quickly melting iceberg. 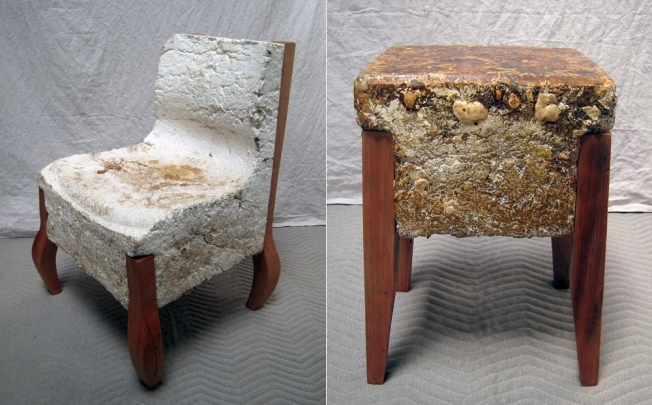 Meet one of the latest innovations: Fungus furniture. 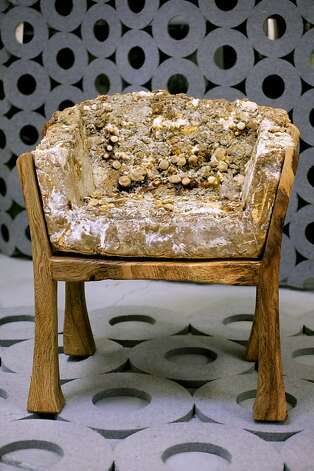 Here’s what it would look like if you “grew” a chair out of mushrooms. Chairs and stools made out of mushrooms are the natural (if not unusual) offspring of a former chef and wild mushroom hunter turned artist, architect and furniture design, right? Philip Ross started out by shaping a cellulose, usually sawdust, into a form that live fungal cells would then feed and grow on, creating unique sculptures. But once he realized how lightweight and strong the material was once it dried out, he turned to more practical applications, building chairs and stools, according to Arstechnica.com. While intrigued at the prospect of mushrooms-turned building material, Craig Vierra, Professor and Assistant Chair for Biological Sciences at the University of the Pacific, shared some initial concerns about it with wired.co.uk. He wondered what type of fungus was used to produce the different pieces and whether it might cause allergic reactions to users. He also questioned whether a resin would be required to seal the product and if that resin might be toxic to the environment. But Ross told the San Francisco Chronicle that his mushroom furniture was perfectly safe to be around. In fact, mycelium, the networks of fungus on top of which mushrooms grow, is a versatile material that’s fire-retardant, compostable, plastic, a good insulator and as structurally strong as concrete. “I’ve shot a handgun at one of these and the network was strong enough to block the bullet; it only went in about five inches,” he told the Chronicle. Okay, so it can take a bullet and support the weight of a weary office worker for eight-plus hours a day? “Sitting on his chairs is much like sitting on leather upholstered furniture, and there’s a welcome bit of give to them,” according to Chronicle reporter Alec Scott. More fungal furniture by Phillip Ross. Most of the furniture is made with wooden legs attached to the mycelium structure with glue and bolts. Citrus oil and other essential oils sanitize the surface and shellac preserves and protects it while also eliminating most of the smell (we know you were wondering). As for how they look, predictably mushroom chairs aren’t quite as streamlined as your average Aeron chair. They’re earthy in shape and color and appropriately toadstoolish; perhaps not the first choice for a company that favors bright colors and sleek furniture. However, with it’s many positive qualities, Ross doesn’t seemed worried about the bulkier aesthetics. “The future is fungal,” he told the Chronicle. The trend to build more earth-friendly furniture has made for some interesting partnerships; now furniture designers are working with not only material scientists and architects, but also biologists and engineers. “Mother Nature has provided us with some of the most outstanding biomaterials that can be used for a plethora of applications in the textile industry. In addition to these, modern technological advances will also allow us to create new biocomposite materials that rely on the fundamentals of natural processes, elevating the numbers and types of materials that are available. But, more importantly, we can generate eco-friendly materials.” Vierra told Wired.co.uk. Stay tuned for more office furniture innovations on Arnolds.